Content compiled by Lea Jacobson and the admins of the group Using Essential Oils Safely. PLEASE NOTE: These comments are just not just my “opinion,” but are based on the safety guidelines of the book Essential Oil Safety by Robert Tisserand. 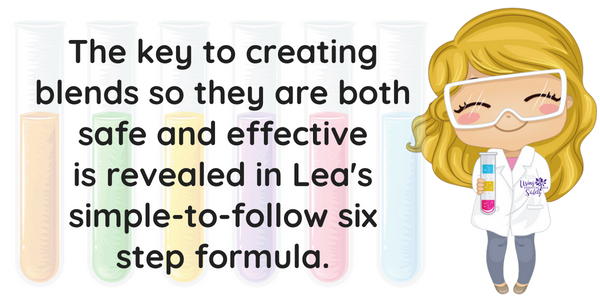 Want to create your own blends? 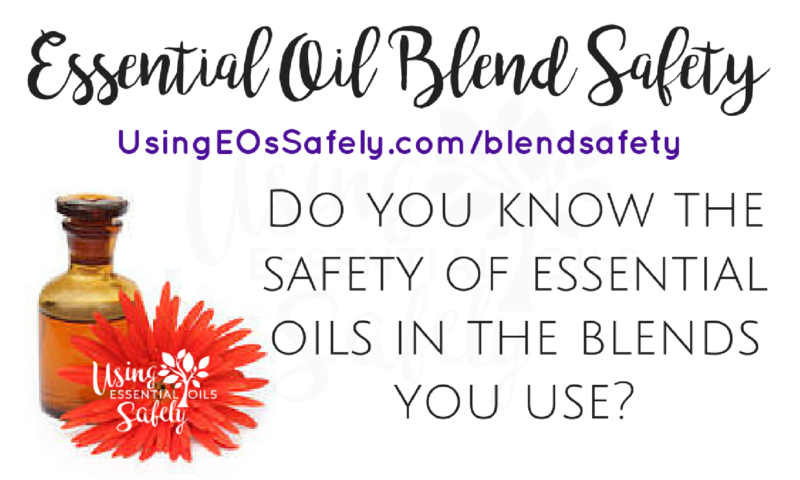 Join the Essential Oil Blending class! Eucalyptus Globulus- do not use on or around children under 10 due to 1,8-cineole content. 1,8-cineole has been known to cause breathing issues in young children. Myrtle- Dilute to 1.9% when using topically. Due to estragole and methyleugenol content, may be potentially carcinogenic. Do not use with babies or children under 5 years old. Care must be taken when using with asthmatics. Oregano- Dilute to 1.1% when using topically, unless you have sensitive or damaged skin, then avoid using altogether. Using more than the recommended dilution can cause adverse reactions such as blood thinning, embryotoxicity, sensitization, or mucous membrane irritation. Ingredients: Lavender Leaf/Flower, Frankincense Resin and Euclalyptus Radiata Leaf/Twig. *Daily Value not established. Euclalyptus- do not use on or around children under 10 due to 1,8-cineole content. 1,8-cineole has been known to cause breathing issues in young children. Ingredients: Spruce (Tsuga canadensis) Needle, Peppermint Leaf, Orange Peel, Thyme Leaf/Flower, Marjoram Flowering Plant, Lemon Peel, Vetiver Root First off this is a gelcap and they suggest, “Take one softgel in the morning and one softgel in the evening daily with food and water”. Ingesting is not a safe way to use oils even in a softgel. Peppermint– Ingesting peppermint oil has been known to cause liver toxicity. Use with caution if you suffer from GERD, cholestasis, or have G6PD deficiency. Using topically while lactating may cause supply to decrease. Avoid using with children under the age of 6 due to possible respiratory distress. Lemon– assuming the Lemon in this blend is expressed; it is phototoxic if more than 12 drops per ounce are used. Basil Leaf – Various safety concerns depending on which type is used. Grapefruit – phototoxic if more than 24 drops per ounce are used. Cypress – If this is blue cypress than it should be avoided during pregnancy and lactation. It may interact with drugs and may be fetotoxic. There is no Latin name given so it’s hard to tell what type it is. Peppermint – Using more than the recommended 5.4% dilution on the skin can cause adverse reactions such as redness, irritation, skin sensitization, or mucous membrane irritation. Use with caution if you suffer from GERD, cholestasis, or have G6PD deficiency. Using topically while lactating may cause supply to decrease. Avoid using with children under the age of 6 due to possible respiratory distress. Ingredients: Spruce, Ho Wood, Frankincense, Blue Tansy, Blue Chamomile in fractionated coconut oil. This is pre-diluted, but we don't know how much. Ho Wood Cinnamomum camphora linalooliferum – no safety issues with this chemotype. Frankincense –which kind? Boswellia payprifera is not recommended during pregnancy and lactation due to constituent octyl acetate. Blue Tansy– only an issue if you have problems metabolizing CYP2D6 drugs. Blue Chamomile– only an issue if you have problems metabolizing CYP2D6 drugs. Ingredients: Laurel Leaf, Peppermint, Eucalyptus, Melaleuca, Lemon, Ravensara, Cardamom Seed. Eucalyptus –do not use on or around children under 10 due to 1,8-cineole content. 1,8-cineole has been known to cause breathing issues in young children. Lemon– assuming the Lemon in this blend is expressed; it is phototoxic if more than 12 drops per ounce is used. Ravensara –“potentially carcinogenic” and may inhibit blood clotting. Should not be taken orally. Dermal max is 0.1%. Cardamom Seed – do not use on or around children under age 10 due to high 1,8-cineole content, which has been known to cause breathing issues in young children. Ingredients: Laurel Leaf, Peppermint, Eucalyptus, Melaleuca, Lemon, Ravensara. Ravensara –“potentially carcinogenic” and may inhibit blood clotting. Should not be taken orally. Dermal max is .1%. Ingredients: citrus sinensis (wild orange) peel oil expresses, Eugenia caryophyllus (clove) bud oil, illicium verum (star anise) fruit/seed oil, backhousia corridora (lemon Myrtle) leaf oil, myristica fragrans (nutmeg) kernel oil, vanilla planifolia (vanilla) bean extract, zingiber officinale (ginger) oil, cinnamomum zeylanicum (cinnamon) bark oil, geranium macrorrhizum (zdravetz) herb oil. Wild Orange (Citrus sinensis)– No safety issues. Clove (Eugenia caryophyllata)– Dilute to 0.5% when using topically, unless you have sensitive or damaged skin, then avoid using altogether. Using more than the recommended dilution can cause adverse reactions such as blood thinning, embryotoxicity, sensitization, or mucous membrane irritation. Due to methyleugenol content, may be potentially carcinogenic – always follow maximum dilution guideline. Do not use topically with children under age 2. Do not use internally, especially if you are on anticoagulant medications, about to have surgery, have a peptic ulcer or bleeding disorders, or take pethidine, MAOIs, or SSRIs. ANISE (STAR)(Illicium verum)– Dilute to 1.75% when using topically. Using more than the recommended dilution may cause adverse reactions such as blood thinning. Due to estragole and safrole content, may be potentially carcinogenic – always follow maximum dilution guideline. Avoid using if pregnant or breastfeeding. Do not use with children under age 5. Avoid if you have endometriosis or estrogen-dependent cancers. Do not use internally, especially if you are on anticoagulant and/or diabetes medications, about to have surgery, have a peptic ulcer, or bleeding disorders. Lemon Myrtle (Backhousia citriodora) – Dilute to 0.7% when using topically, unless you have sensitive or damaged skin, then avoid using altogether. Using more than the recommended dilution can cause adverse reactions such as teratogenicity and sensitization. Do not use topically with children under age 2. Avoid using if you are taking drugs metabolized by CYP2B6. Do not use internally, especially if you are on diabetes medications or pregnant. As a precaution, you may also want to avoid internal use if breastfeeding. Nutmeg (Myristica fragrans)– Dilute to 0.8% when using topically. Using more than the recommended dilution can cause adverse reactions. Due to methyleugenol and safrole content, may be potentially carcinogenic – always follow maximum dilution guideline. Vanilla Oleoresin (Vanilla planifolia)- Because this is an “absolute” and not an essential oil, it is not soluble in a carrier oil, but in alcohol. Best if used in room sprays, or very low dilution when used topically. Cinnamon Bark (Cinnamomum zeylanicum blume)- Dilute to 0.07% when using topically. Using more than the recommended dilution can cause adverse reactions such as blood thinning, embryotoxicity, sensitization, or mucous membrane irritation. Avoid using if pregnant or breastfeeding (all routes). Do not use internally, especially if you are on anticoagulant and/or diabetes medications, about to have surgery, have a peptic ulcer, or bleeding disorders. Ingredients: Wild Orange, Lemon, Grapefruit, Mandarin, Bergamot, Tangerine, Clementine, Vanilla Bean Absolute. Phototoxicity is the biggest issue here. This would be AWESOME for diffusing, but I would dilute heavily before applying to the skin. How much dilution is hard to say as we don't know the % of EOs in this blend. In reality, the sun should be avoided for up to 48 hours after applying leave-on phototoxic EOs (in wash-off products it is fine). Bergamot- phototoxic if more than 1 drop is used per ounce of carrier. Ylang Ylang (Cananga odorata)- Dilute to no more than 0.8% when using topically, unless you have sensitive or damaged skin, then avoid using altogether. Using more than the recommended dilution can cause adverse reactions such as sensitization. Do not use topically with children under age 2. Fennel (Foeniculum vulgare)- Dilute to 2.5% when using topically. Using more than the recommended dilution can cause adverse reactions such as blood thinning, reproductive hormone modulation, or sensitization. Due to estragole content, may be potentially carcinogenic – always follow maximum dilution guideline. Avoid using if pregnant or breastfeeding. Do not use (any route) on or around children under age 5. Avoid if you have endometriosis or estrogen-dependent cancers. Do not use internally, especially if you are on anticoagulant and/or diabetes medications, about to have surgery, have a peptic ulcer, or bleeding disorders. Carrot Seed – Carrot seed should not be used during pregnancy as it may prevent implantation and interfere with gestation. Vitex- (Chaste Tree)- Do not use while pregnant or breastfeeding. Do not use if you have problems metabolizing CYP2D6 drugs. Frankincense – no Latin name given….if it is Boswellia payprifera, is not recommended during pregnancy and lactation due to constituent oclyl acetate. Wild Orange [Sweet Orange] – no safety issues. Clove– Moderate risk for skin sensitization. Moderate risk for mucous membrane irritation. May inhibit blood clotting. Drug interaction. Do not take orally if on pethidine, MAOIs or SSRIs, anticoagulant meds, or if you are going to have surgery, have a peptic ulcer, or other bleeding disorders. Do not use topically on sensitive skin, broken or damaged skin. Do not use topically on children under age 2. Ingredients: Wintergreen, Camphor, Peppermint, Blue Tansy, Blue Chamomile, Helichyrusum, Osmanthus. Camphor –depending on the species (no Latin name listed), this could be the carcinogenic species. No way to know! Peppermint –do not use on or around children under 6 due to menthol and 1,8-cineole content. Menthol & 1,8-cineole has been known to cause breathing issues in young children. Blue Tansy – only an issue if you have problems metabolizing CYP2D6 drugs. Ingredients: Peppermint, Ginger, Coriander, Tarragon, Anise, Fennel, and Caraway. Coriander – not sure if this blend uses Leaf or Seed. Either way, no safety issues. Tarragon – Potential carcinogen, based on estragole and methyleugenol content. Inhibits blood clotting. Should not be taken in oral doses (any age). Anise (Illicium verum)– Dilute to 1.75% when using topically. Using more than the recommended dilution may cause adverse reactions such as blood thinning. Due to estragole and safrole content, may be potentially carcinogenic – always follow maximum dilution guideline. Avoid using if pregnant or breastfeeding. Do not use with children under age 5. Avoid if you have endometriosis or estrogen-dependent cancers. Do not use internally, especially if you are on anticoagulant and/or diabetes medications, about to have surgery, have a peptic ulcer, or bleeding disorders. Caraway – no safety issues unless oxidized. Lavandin – May inhibit blood clotting. Lemon Myrtle – Teratogenicity, Do not apply to damaged skin, do not apply to children under 2, Do not use if you take drops metabolized by CYP2B6, Do not take orally if pregnant or have diabetes. Melissa (Melissa officinalis)- Dilute to 0.9% when using topically, unless you have sensitive or damaged skin, then avoid using altogether. Using more than the recommended dilution can cause adverse reactions such as teratogenicity and sensitization. Do not use topically with children under age 2. Avoid using if you are taking drugs metabolized by CYP2B6. Do not use internally, especially if you are on diabetes medications or pregnant. As a precaution, you may also want to avoid internal use if breastfeeding. Bergamot- Could be Phototoxic if more than 1 drop is used per ounce of carrier. Juniper Berry– When ingested, can cause kidney irritation and damage, has GRAS Status. Arborvitae – neurotoxic based on thujone content. Dermal maximum 0.25%. Do not use if pregnant or breastfeeding. Nootka-also known as Alaska Cypress or Yellow Cedarwood oil- no safety info available, but we can only guess that it is safe as most other cypress and cedarwoods are safe. Thyme leaf– There can be issues depending on the type. Latin names do matter. Citronella– Dilute to a maximum of 18.2% when using topically. Using more than the recommended dilution can cause adverse reactions such as skin sensitization. Do not use internally if you are taking drugs metabolized by CYP2B6. Frankincense Resin– without a botanical name it is hard to discern safety information — Boswellia payprifera is not recommended during pregnancy and lactation due to constituent octyl acetate. This is listed as “resin” which is a solid and not an oil, which seems a bit misleading. Lavender – Not sure as to what type so there may or may not be safety concerns. French/Spanish Lavender (Lavandula stoechas) which contains fenchone and camphor and is not recommended during pregnancy and lactation. Spike lavender contains 1,8-cineole so may not be child safe. Myrrh Resin– Due to B-elemene and furanodiene content, may be fetotoxic. Avoid using if pregnant or breastfeeding. This is listed as “resin” which is a solid and not an oil, which seems a bit misleading. Rose – Topical max: 0.6% dilution. Ingredients: Amyris Bark, Patchouli Leaf, Frankincense Resin, Lime Peel, Ylang Ylang Flower, Hawaiian Sandalwood Wood, Roman Chamomile Flower Please be aware that even though this blend comes in a roller ball it appears to be undiluted, so please be sure to properly dilute before using topically. Lime (Citrus aurantifolia) – Dilute to 0.7% when using topically. Using more than the recommended dilution can cause adverse reactions such as phototoxicity and sensitization. Cinnamon Bark– High risk for sensitization. Mucous membrane irritant (low risk). May inhibit blood clotting. Drug interaction. Do not use if pregnant and/or breastfeeding. Do not use orally if on diabetes meds, on anticoagulant meds, if going to have surgery, have a peptic ulcer, or other bleeding disorders. Clove Bud– Moderate risk for skin sensitization. Moderate risk for mucous membrane irritation. May inhibit blood clotting. Drug interaction. Do not take orally if on pethidine, MAOIs or SSRIs, anticoagulant meds, or if you are going to have surgery, have a peptic ulcer, or other bleeding disorders. Do not use topically on sensitive skin, broken or damaged skin. Do not use topically on children under age 2. Eucalyptus– do not use on or around children under 10 due to 1,8-cineole content. 1,8-cineole has been known to cause breathing issues in young children. Rosemary– Maybe neurotoxic, depending on how much camphor is in the EO (check the GC/MS report!). Avoid using with children under the age of 10 due to possible respiratory distress. Ingredients: Glycerin, Water, Hydrated Silica, Hydroxyapatite, Xylitol, Calcium Carbonate, Cellulose Gum, Mentha piperita (peppermint) Essential Oil, Citrus sinensis (Wild Orange) Essential Oil, Eugenia caryophyllata (Clovebud) Essential Oil, Cinnamonum zeylanicum (Cinnamon Bark) Essential Oil, Eucalyptus radiata (Eucalyptus) Essential Oil, Rosemarinus officinalis (Rosemary) Essential Oil, Stevia rebaudiana (Stevia) Extract, Gaultheria procumbens (Wintergreen) Essential Oil, Commiphora myrrha (Myrrh) Essential Oil, Sodium Lauroyl Sarcosinate (not the nasty ingredient – this one is safe) , Carrageenan, Titanium Dioxide. Peppermint (Mentha piperita) – Using more than the recommended 5.4% dilution on the skin can cause adverse reactions such as redness, irritation, skin sensitization, or mucous membrane irritation. Use with caution if you suffer from GERD, cholestasis, or have G6PD deficiency. Using topically while lactating may cause supply to decrease. Avoid using with children under the age of 6 due to possible respiratory distress. Clove Bud (Eugenia caryophyllus)– Moderate risk for skin sensitization. Moderate risk for mucous membrane irritation. May inhibit blood clotting. Drug interaction. Do not take orally if on pethidine, MAOIs or SSRIs, anticoagulant meds, or if you are going to have surgery, have a peptic ulcer, or other bleeding disorders. Do not use topically on sensitive skin, broken or damaged skin. Do not use topically on children under age 2. Cinnamon Bark (Cinnamomum verum)– High risk for sensitization. Mucous membrane irritant (low risk). May inhibit blood clotting. Drug interaction. Do not use if pregnant and/or breastfeeding. Do not use orally if on diabetes meds, on anticoagulant meds, if going to have surgery, have a peptic ulcer, or other bleeding disorders. Eucalyptus (Radiata)– Avoid using with children under the age of 10 due to high 1,8-cineole which can cause respiratory distress. Do not ingest if you suffer from irritation of the GI tract or bile ducts or if you have any liver issues. Rosemary (Rosmarinus officinalis)– Maybe neurotoxic depending on how much camphor is in the EO (check the GC/MS report!). Cineole ct: Avoid using with children under the age of 10 due to possible respiratory distress due to high levels of 1,8-cineole. Wintergreen (Gaulteria procumbens)- Dilute to no more than 2.4% when using topically. Using more than the recommended dilution can cause adverse reactions such as blood thinning, toxicity, or teratogenicity. Avoid using if pregnant or breastfeeding. Do not use topically or diffuse around children till after the age of 10 yr old . Avoid if you are taking anticoagulant medication, about to have surgery, have a peptic ulcer, bleeding disorders, salicylate sensitivity, or ADD/ADHD. Do not use internally, especially if you have GERD. Myrrh (Commiphora myrrha)- Due to Belemene and furanodiene content, may be fetotoxic. Avoid using if pregnant or breastfeeding. Lavender Flower – Not sure as to what type so there may or may not be safety concerns. French/Spanish Lavender (Lavandula stoechas) which contains fenchone and camphor and is not recommended during pregnancy and lactation. Peppermint Plant – Using more than the recommended 5.4% dilution on the skin can cause adverse reactions such as redness, irritation, skin sensitization, or mucous membrane irritation. Use with caution if you suffer from GERD, cholestasis, or have G6PD deficiency. Using topically while lactating may cause supply to decrease. Avoid using with children under the age of 6 due to possible respiratory distress. Rosemary Leaf – Maybe neurotoxic, depending on how much camphor is in the EO (check the GC/MS report!). Avoid using with children under the age of 10 due to possible respiratory distress. Lavender Flower – Not sure as to what type so there may or may not be safety concerns. French/Spanish Lavender (Lavandula stoechas) which contains fenchone and camphor and is not recommended during pregnancy and lactation. Spike lavender contains 1,8-cineole so may not be child safe. Ylang Ylang flower (Cananga odorata)- Dilute to no more than 0.8% when using topically, unless you have sensitive or damaged skin, then avoid using altogether. Using more than the recommended dilution can cause adverse reactions such as sensitization. Do not use topically with children under age 2. Marjoram Leaf – No safety issues but is said to decrease libido. Is this Spanish marjoram or sweet marjoram? Spanish marjoram contains 1,8-cineole so is not child safe. Ingredients: Lemon Peel, Lime Peel, Siberian Fir Needle, Austrian Fir Needle, Pine Needle, Citronella Grass, Melaleuca Leaf, Cilantro Herb essential oils. Lemon– assuming the Lemon in this blend is expressed, it is phototoxic if more than 12 drops per ounce are used. Ingredients: Lavender Flower, Sweet Marjoram Leaf, Roman Chamomile Flower, Ylang Ylang Flower, Hawaiian Sandalwood essential oils and Vanilla Bean Absolute. Ho Wood Leaf (Cinnamomum camphora linalooliferum)- no safety issues with this chemotype. Vetiver Root –Dilute to no more than 15% when using topically. Grapefruit- phototoxic if more than 24 drops per ounce is used. Lemon- assuming the Lemon in this blend is expressed, it is phototoxic if more than 12 drops per ounce are used. Peppermint- Using more than the recommended 5.4% dilution on the skin can cause adverse reactions such as redness, irritation, skin sensitization, or mucous membrane irritation. Use with caution if you suffer from GERD, cholestasis, or have G6PD deficiency. Using topically while lactating may cause supply to decrease. Avoid using with children under the age of 6 due to possible respiratory distress. Cinnamon- What kind? If it is bark there is a high risk for sensitization. Mucous membrane irritant (low risk). May inhibit blood clotting. Drug interaction. Do not use if pregnant and/or breastfeeding. Do not use orally if on diabetes meds, on anticoagulant meds, if going to have surgery, have a peptic ulcer, or other bleeding disorders. Ingredients: Lemon, Eucalyptus, Citronella, Lemongrass and 11 other ingredients they do not tell us in a base of fractionated coconut oil. Lemon– assuming the Lemon in this blend is expressed, it is phototoxic if more than 12 drops per ounce is used. Ingredients: Ylang Ylang Flower, Nootka Wood, Cedarwood Wood, Catnip, Lemon Eucalyptus, Litsea Fruit, Arborvitae Wood essential oils and Vanilla Bean Absolute in a base of Fractionated Coconut Oil and Tamanu Seed Oil. Fractionated coconut oil & tamanu- Both carrier oils, but still no indication of the dilution rate. Nootka- also known as Alaska Cypress or Yellow Cedarwood oil- no info safety info available, but we can guess that it is safe as most other cypress and cedarwoods are safe. Arborvitae- neurotoxic based on thujone content. Dermal maximum 0.25%. Do not use if pregnant or breastfeeding. Ingredients: Bergamot Peel, Ylang Ylang Flower, Patchouli Leaf, Vanilla Bean Absolute, Jasmine Flower Absolute, Cinnamon Bark, Labdanum, Vetiver Root, Hawaiian Sandalwood, Cocoa Bean Absolute, Rose Flower essential oils in a base of Fractionated Coconut Oil ** Please note that this is a diluted blend, but we do not know how much! Bergamot – phototoxic if more than 1 drop is used per ounce of carrier. Lemon (Citrus limon)- Dilute to 2% when using topically. Using more than the recommended dilution can cause adverse reactions such as phototoxicity. Juniper Berry (Juniperus communis)- When ingested, can cause kidney irritation and damage, has GRAS Status. Sandalwood – East – Indian (Santalum album)- Dilute to 2% when using topically. Using more than the recommended dilution may cause rare adverse skin reactions. Blue Tansy (Tanacetum annuum)– Avoid using if you are taking drugs metabolized by CYP2D6. Do not use internally if taking drugs metabolized by CYP1A2 or CYP3A4. Lemongrass (Cymbopogon flexuosus) – Dilute to 0.7% when using topically, unless you have sensitive or damaged skin, then avoid using altogether. Using more than the recommended dilution can cause adverse reactions such as teratogenicity and sensitization. Do not use topically with children under age 2. Avoid using if you are taking drugs metabolized by CYP2B6. Do not use internally, especially if you are on diabetes medications or pregnant. As a precaution, you may also want to avoid internal use if breastfeeding. “Cinnamon” listed, with no indicator if this is Bark or Leaf. Leaf is preferred when applied to the skin, but still, needs a low dilution of 0.7% (Bark needs to be at .06%). This is pre-diluted, but how much? Enough to prevent skin reactions from the Cinnamon? Rosemary– Maybe neurotoxic depending on how much camphor is in the EO (check the GC/MS report!). Cineole ct: Avoid using with children under the age of 10 due to possible respiratory distress due to high levels of 1,8-cinoele. Lemon (Citrus x limon L.)– it is phototoxic if more than 12 drops per ounce are used. Eucalyptus (globulus)– All species do not use on children under 10 due to 1,8-cineole content. 1,8-cineole has been known to cause breathing issues in young children. Grapefruit (Citrus paradisi) – Dilute to a maximum of 4% when using topically. Using more than the recommended dilution can cause adverse reactions such as photosensitization, or sensitization. Pink Pepper (Schinus molleL.) – Has GRAS status. Sandalwood – East – Indian (Santalum album)– Dilute to 2% when using topically. Using more than the recommended dilution may cause rare adverse skin reactions. Spearmint (Mentha spicata)–Dilute to 1.7% when using topically. Using more than the recommended dilution can cause adverse reactions such as sensitization or mucous membrane irritation. Geranium (Pelargonium graveolens) -Dilute to a maximum of 17.5% when using topically. Using more than the recommended dilution can cause adverse reactions such as sensitization. Do not use internally, especially if you are on diabetes medications, or taking drugs metabolized by CYP2B6. Vanilla (Vanilla planifolia)- Because this is an “absolute” and not an essential oil, it is not soluble in a carrier oil, but in alcohol. Best if used in room sprays, or very low dilution when used topically. Peru Balsam (Myroxylon pereirae)– Dilute to 0.4% when using topically, unless you have sensitive or damaged skin, then avoid using altogether. Using more than the recommended dilution can cause adverse reactions such as sensitization.Do not use topically with children under age 2. Eucalyptus– Eucalyptus globulus – All species do not use on children under 10 due to 1,8-cineole content. 1,8-cineole has been known to cause breathing issues in young children. Frankincense– no safety issues. Unless this is Frankincense -Boswellia payprifera, is not recommended during pregnancy and lactation due to constituent oclyl acetate. Lemon (Citrus x limon L.) – it is phototoxic if more than 12 drops per ounce are used. Wild Orange (Sweet Orange) – no safety issues. Lemon (Citrus limon)– Dilute to 2% when using topically. Using more than the recommended dilution can cause adverse reactions such as phototoxicity. Vetiver (Vetiveria zizanoides)-Dilute to no more than 15% when using topically. Ingredients: White Cedar, Lemongrass, Peppermint, Black Cumin, Helichrysum, Black Pepper. White Cedar, as the first ingredient, is really called Thuja, and is neurotoxic – should not be used more than a .4% dilution. Lemongrass listed as the 2nd ingredient. Lemongrass needs to be included at no more than a .7% dilution, as it is highly irritant/allergenic. Black Cumin – should not be used if pregnant, on the diseased or damaged skin, or kids under 2 – although this blend is recommended on “cold sores, hives, chickenpox, cuts,” etc. Ingredients: Cinnamon, Peppermint, Spearmint, Lime, Ginger, Lavender in Wild Fractionated Coconut Oil. First of all, what is the dilution of this blend? 1%? 10%? “Cinnamon” listed, with no indicator if this is Bark or Leaf. Leaf is preferred when applied to the skin, but still, needs a low dilution of .7% (Bark needs to be at .06%). This is pre-diluted, but how much? Enough to prevent skin reactions from the Cinnamon? Cinnamon Bark – High risk for sensitization. Mucous membrane irritant (low risk). May inhibit blood clotting. Drug interaction. Do not use if pregnant and/or breastfeeding. Do not use orally if on diabetes meds, on anticoagulant meds, if going to have surgery, have a peptic ulcer, or other bleeding disorders. Spearmint– max dermal use level of 1.7%. Since this is a pre-diluted blend, we don't know if the Spearmint is higher than this recommended level. Lavender-which kind? No Latin name to identify if this is French/Spanish Lavender (Lavandula stoechas) which contains fenchone and camphor and is not recommended during pregnancy and lactation. Ingredients: Clove Bud, Cinnamon Bark, Lemon, Eucalyptus citriodora, Thyme, Orange, Oregano, Nutmeg, Rosemary, Mandarin, Ginger Root. Clove Bud –Moderate risk for skin sensitization. Moderate risk for mucous membrane irritation. May inhibit blood clotting. Drug interaction. Do not take orally if on pethidine, MAOIs or SSRIs, anticoagulant meds, or if you are going to have surgery, have a peptic ulcer, or other bleeding disorders. Do not use topically on sensitive skin, broken or damaged skin. Do not use topically on children under age 2. Cinnamon Bark –High risk for sensitization. Mucous membrane irritant (low risk). May inhibit blood clotting. Drug interaction. Do not use if pregnant and/or breastfeeding. Do not use orally if on diabetes meds, on anticoagulant meds, if going to have surgery, have a peptic ulcer, or other bleeding disorders. Dilution max of .07%. Lemon –assuming the Lemon in this blend is expressed, it is phototoxic if more than 12 drops per ounce is used. Eucalyptus citriodora– Lemon Eucalyptus doesn't have any safety issues. Thyme– What kind? No Latin name listed. Orange – What kind? Bitter Orange is Phototoxic. Oregano– What kind? Max dermal use is 1.1% and has other safety issues depending on species. For example, Origanum anites can cause embryotoxicity and should be avoided during pregnancy. Rosemary – which kind? There are several chemotypes, and it does matter. Maybe neurotoxic, depending on how much camphor is in the EO (check the GC/MS report!). Avoid using with children under the age of 10 due to possible respiratory distress. Ingredients: Lemongrass, Rosemary, Tea Tree, Lavender, Myrtle, Citronella. Lemongrass- is listed first? Needs a .7% dilution to follow guidelines in Essential Oil Safety. Rosemary – which kind? There are several chemotypes, and it does matter. Maybe neurotoxic, depending on how much camphor is in the EO (check the GC/MS report!). Do not use on or around children under 6 due to 1,8-cineole content. 1,8-cineole has been known to cause breathing issues in young children. Myrtle– what kind? It matters. Some are not recommended during pregnancy and on children. Hard to tell since no Latin names are listed. Ingredients: Lavender, Frankincense, Carrot Seed, Neroli, Roman Chamomile, Rose Otto in a base of Cucumber Seed oil. First of all, what is the dilution of this blend? 1%? 10%? Frankincense –which kind? (Boswellia payprifera) is not recommended during pregnancy and lactation due to constituent oclyl acetate. Ingredients: Petitgrain, Bergamot, Cedarwood Atlas, Grapefruit, Lavender, and Vetiver. Bergamot (Citrus bergamia)- We cannot tell could be phototoxic, if more than 1 drop is used per ounce of carrier. Vetiver (Vetiveria zizanoides)- Dilute to no more than 15% when using topically. Ingredients: Petitgrain, Bergamot, Cedarwood Atlas, Grapefruit, Lavender, and Vetiver diluted to 2% in fractionated coconut oil. Grapefruit (Citrus paradisi)– Dilute to a maximum of 4% when using topically. Using more than the recommended dilution can cause adverse reactions such as photosensitization, or sensitization. German Chamomile- only an issue if you have problems metabolizing CYP2D6 drugs. Carrot Seed– should not be used during pregnancy as it may prevent implantation and interfere with gestation. Grapefruit- phototoxic if more than 24 drops per ounce are used. Rosemary- Maybe neurotoxic, depending on how much camphor is in the EO (check the GC/MS report!). Avoid using with children under the age of 10 due to possible respiratory distress. Tea Tree (Melaleuca alternifolia)– Dilute to no more than 15% when using topically. Using more than the recommended dilution can cause adverse reactions such as sensitization. Blue Tansy (Tanacetum annuum) aka Chamomile Moroccan Blue Organic(Tanacetum annuum) – Avoid using if you are taking drugs metabolized by CYP2D6. Do not use internally if taking drugs metabolized by CYP1A2 or CYP3A4. Ingredients: Pink Grapefruit, Bergamot, Palmarosa, Juniper Berry, Basil linalool, Lemon, Rosemary, Peppermint, Litsea (May Chang) and Star Anise. Juniper Berry (Juniperus communis)- No safety issues, When ingesting, can cause kidney irritation and damage, has GRAS Status. Anise (Star) (Illicium verum)– Dilute to 1.75% when using topically. Using more than the recommended dilution may cause adverse reactions such as blood thinning. Due to estragole and safrole content, may be potentially carcinogenic – always follow maximum dilution guideline. Avoid using if pregnant or breastfeeding. Do not use with children under age 5. Avoid if you have endometriosis or estrogen-dependent cancers. Do not use internally, especially if you are on anticoagulant and/or diabetes medications, about to have surgery, have a peptic ulcer, or bleeding disorders. Lavender Spike (Lavandula latifolia)- Dilute to no more than 19% when using topically. Due to camphor content, may be mildly neurotoxic. Tagetes (Tagetes minuta)- Dilute to 0.01% when using topically. Using more than the recommended dilution can cause adverse reactions such as phototoxicity. Oregano (Origanum vulgare, Origanum onites)- Dilute to 1.1% when using topically, unless you have sensitive or damaged skin, then avoid using altogether. Using more than the recommended dilution can cause adverse reactions such as blood thinning, embryotoxicity, sensitization, or mucous membrane irritation, Also Inhibits blood clotting, Do not use on children under 2 yo, Do not us in all routes if pregnant or breastfeeding. Drug interactions Antidiabetic or anticoagulant medications, because of cardiovascular effects. Clove (Syzygium aromaticum)- Moderate risk for skin sensitization. Moderate risk for mucous membrane irritation. May inhibit blood clotting. Drug interaction. Do not take orally if on pethidine, MAOIs or SSRIs, anticoagulant meds, or if you are going to have surgery, have a peptic ulcer, or other bleeding disorders. Do not use topically on sensitive skin, broken or damaged skin. Do not use topically on children under age 2. Eucalyptus (Eucalyptus globules) – All species do not use on children under 10 due to 1,8-cineole content. 1,8-cineole has been known to cause breathing issues in young children. Cinnamon Cassia (Cinnamomum cassia)- High risk of sensitization. Mucous membrane irritant (low risk). May inhibit blood clotting. Drug interaction. Do not use if pregnant and/or breastfeeding. Do not use orally if on diabetes meds, on anticoagulant meds, if going to have surgery, have a peptic ulcer, or other bleeding disorders. MAX DILUTION: 0.01%* due to cinnamaldehyde content. Do not use topically on children under the age of 2. Rosemary (Rosmarinus Officinalis ct 1,8-Cineole)- Maybe neurotoxic depending on how much camphor is in the EO (check the GC/MS report!). Cineole ct: Avoid using with children under the age of 10 due to possible respiratory distress due to high levels of 1,8-cinoele. Petitgrain – Using more than topical max (0.4%) can cause irritation or sensitization. Blue Tansy (Tanacetum annuum)– only an issue if you have problems metabolizing CYP2D6 drugs. Sweet Orange (Wild Orange) – no safety issues. Geranium– no safety issues. *Do not take orally if on diabetes meds or drugs metabolized by CYP2B6. Peppermint – Using more than the recommended 5.4% dilution on the skin can cause adverse reactions such as redness, irritation, skin sensitization, or mucous membrane irritation. Use with caution if you suffer from GERD, cholestasis, or have a G6PD deficiency. Using topically while lactating may cause supply to decrease. Avoid using with children under the age of 6 due to possible respiratory distress. Ingredients: Fir Needle, Rosalina, Spruce, Cypress, Spearmint and Cedarwood Virginian. Spearmint leaf extract Mentha spicata: Spearmint- max dermal use level of 1.7%. Ingredients: Petitgrain, Dill, Chamomile Roman, Spearmint and Ginger (steam distilled). Spearmint– max dermal use level of 1.7%. Ylang Ylang Complete (Cananga odorata)- Dilute to no more than 0.8% when using topically, unless you have sensitive or damaged skin, then avoid using altogether. Using more than the recommended dilution can cause adverse reactions such as sensitization. Do not use topically with children under age 2. Ravintsara (Cinnamomum camphora ct. cineole)- Dilute to no more than 11% when using topically. Do not use with children under age 10, as it can cause slowed respiration due to high 1,8-cineole content. Ingredients: Helichrysum gymnocephalum, Wintergreen, Clove Bud, Cypress, Peppermint, and Sweet Marjoram. Peppermint- Using more than the recommended 5.4% dilution on the skin can cause adverse reactions such as redness, irritation, skin sensitization, or mucous membrane irritation. Use with caution if you suffer from GERD, cholestasis, or have a G6PD deficiency. Using topically while lactating may cause supply to decrease. Avoid using with children under the age of 6 due to possible respiratory distress. Oregano Dilute to 1.1% when using topically, unless you have sensitive or damaged skin, then avoid using altogether. Using more than the recommended dilution can cause adverse reactions such as blood thinning, embryotoxicity, sensitization, or mucous membrane irritation. Spearmint – max dermal use level of 1.7%. Caprylic/capric triglyceride – A mixed triester derived from coconut oil and glycerin. To what % they do not say. Eucalyptus Globulus– do not use on or around children under 10 due to 1,8-cineole content. 1,8-cineole has been known to cause breathing issues in young children. Eucalyptus staigeriana† leaf oil-Known as Lemon Balm (Australian) – issue if you have problems metabolizing CYP2D6 drugs. Max Dermal use 3.4%. Pregnancy and Breastfeeding Dermal Max 3.4% due to Citral, diffuse with caution Reproductive toxicity can affect fetal development. Mentha piperita† (Peppermint) oil- Using more than the recommended 5.4% dilution on the skin can cause adverse reactions such as redness, irritation, skin sensitization, or mucous membrane irritation. Use with caution if you suffer from GERD, cholestasis, or have a G6PD deficiency. Using topically while lactating may cause supply to decrease. Avoid using with children under the age of 6 due to possible respiratory distress. Eucalyptus radiata† leaf oil- do not use on or around children under 10 due to 1,8-cineole content. 1,8-cineole has been known to cause breathing issues in young children. Callitris intratropica† (Blue cypress) wood oil- Avoid during pregnancy and lactation. It may interact with drugs and may be fetotoxic. Eucalyptus bicostata† leaf oil- no information assume same as other Eucalyptus.. do not use on or around children under 10 due to 1,8-cineole content. 1,8-cineole has been known to cause breathing issues in young children. Myrtus communis† (Myrtle) oil – Dilute to 1.9% when using topically. Due to estragole and methyleugenol content, may be potentially carcinogenic. Do not use with babies or children under 5 years old. Care must be taken when using with asthmatics. Ingredients: Mentha piperita† (Peppermint) oil, Caprylic/ capric triglyceride, Citrus limon† (Lemon) peel oil, Abies balsamea† (Balsam Canada) needle oil, Eugenia caryophyllus† (Clove) bud oil, Copaifera officinalis† (Balsam copaiba) resin, Cocos nucifera (Coconut) oil, Gaultheria procumbens† (Wintergreen) leaf oil, Helichrysum italicum† flower oil, Vetiveria zizanoides† (Vetiver) root oil, Hyptis suaveolens† (Dorado azul) seed oil ** This is a diluted blend with two different types of coconut oil, but how much? Dilution rate unknown! Peppermint – Ingesting peppermint oil has been known to cause liver toxicity. Use with caution if you suffer from GERD, cholestasis, or have a G6PD deficiency. Using topically while lactating may cause supply to decrease. Avoid using with children under the age of 6 due to possible respiratory distress. Tarragon- Potential carcinogen, based on estragole and methyleugenol content. Inhibits blood clotting. Should NOT be taken in oral doses (any age). Peppermint- Using more than the recommended 5.4% dilution on the skin can cause adverse reactions such as redness, irritation, skin sensitization, or mucous membrane irritation. Use with caution if you suffer from GERD, cholestasis, or have a G6PD deficiency. Using topically while lactating may cause supply to decrease. Avoid using with children under the age of 6 due to possible respiratory distress. Ingesting peppermint oil has been known to cause liver toxicity. Juniper- No safety issues when used topically. When ingesting, can cause kidney irritation and damage. Lemongrass- Lemongrass needs to be included at no more than a .7% dilution, as it is highly irritant/allergenic. Do not ingest if on diabetic medication or pregnant. Anise- Potential carcinogen based on estragole content. Reproductive hormone modulator. May inhibit blood clotting. Avoid if pregnant, breastfeeding, have endometriosis or estrogen-dependent cancers. Don't use on children under 5 years of age. Do not use orally if on diabetes meds, diuretic meds, anticoagulant meds, if you have kidney issues, are having major surgery, peptic ulcer, or other bleeding issues. Patchouli- may inhibit blood clotting. Do not ingest if on anticoagulant medication, peptic ulcer, hemophilia, any other bleeding disorders or if you will be having surgery. Marjoram- no safety issues if sweet. Is this Spanish marjoram or sweet marjoram? Spanish marjoram contains 1,8-cineole so is not child safe. Yarrow- Do not take if on drugs metabolized by CYP2D6. Anise – Potential carcinogen based on estragole content. Reproductive hormone modulator. May inhibit blood clotting. Avoid if pregnant, breastfeeding, have endometriosis or estrogen-dependent cancers. Don't use on children under 5 years of age. Do not use orally if on diabetes meds, diuretic meds, anticoagulant meds, if you have kidney issues, are having major surgery, peptic ulcer, or other bleeding issues. Matricaria – Also known as German Chamomile – only an issue if you have problems metabolizing CYP2D6 drugs. Grapefruit – phototoxic if more than 24 drops per ounce is used. Lemon – assuming the Lemon in this blend is expressed, it is phototoxic if more than 12 drops per ounce is used. Ocotea – Not enough info was known. Proceed with caution. Ingredients: Sesame seed oil, Spearmint (Mentha spicata), Sage (Salvia officinalis), geranium (Pelargonium graveolens), Myrtle (Myrtus communis), Nutmeg (Myristica fragrans), and German chamomile (Matriciaria recutita). Sesame seed oil- This is a diluted blend, but how much?? Spearmint- max dermal use level of 1.7%. Since this is a pre-diluted blend, we don't know if the Spearmint is higher than this recommended level. Sage- Do not use while pregnant or breastfeeding. Should NOT be taken orally. Geranium- no safety issues topically. Do not take orally if on diabetes meds or drugs metabolized by CYP2B6. Myrtle- this species is “potentially carcinogenic” based on estragole and methyleugenol content. Do not ingest if on diabetes meds. Ingredients: Rosemary (Rosmarinus officinalis), juniper (Juniperus osteosperma and J. scopulorum), lemongrass (Cymbopogon flexuosus), nutmeg (Myristica fragrans), Idaho balsam fir (Abies balsamea), clove (Syzygium aromaticum), and black pepper (Piper nigrum). Rosemary – Maybe neurotoxic depending on how much camphor is in the EO (check the GC/MS report!). Cineole ct: Avoid using with children under the age of 10 due to possible respiratory distress due to high levels of 1,8-cineole. Clove – Moderate risk for skin sensitization. Moderate risk for mucous membrane irritation. May inhibit blood clotting. Drug interaction. Do not take orally if on pethidine, MAOIs or SSRIs, anticoagulant meds, or if you are going to have surgery, have a peptic ulcer, or other bleeding disorders. Do not use topically on sensitive skin, broken or damaged skin. Do not use topically on children under age 2. Pinus ponderosa (Ponderosa pine) –Potentially carcinogenic, based on estragole content. Dermal maximum of 0.5% if using. Not for children. Thuja plicata (ARBORTITAE) (also known as Western Red Cedar– Dilute to 0.25% when using topically. Using more than the recommended dilution may cause neurotoxicity due to thujone content. Avoid using if pregnant or breastfeeding. Avoid using if you have a seizure disorder. Do not use internally. Ingredients: Rosewood, Geranium, Palmarosa, Lavender, Roman chamomile, Ylang Ylang, Lemon, Jasmine, Bergamot, Rose ** Please note: This blend is often suggested to use on babies and despite the name and even though most of the oils in this blend have no special safety issues, we suggest NOT using any EOs topically on children under the age of 2 due to their thinner skin and underdeveloped immune system. If you choose to do so for an acute situation please dilute to only 0.25% and this should be the exception and not the norm. Ylang Ylang(Cananga odorata)- Dilute to no more than 0.8% when using topically, unless you have sensitive or damaged skin, then avoid using altogether. Using more than the recommended dilution can cause adverse reactions such as sensitization. Do not use topically with children under age 2. Spanish sage- Do not use while pregnant, on or around children age 5 or under, or if you have asthma. Lemon assuming the Lemon in this blend is expressed; it is phototoxic if more than 12 drops per ounce is used. Caprylic/capric glycerides- Coconut oil, this is a diluted blend. How much? Palo Santo- Dilute to no more than 3.4% when using topically. Blue Cypress – Avoid during pregnancy and lactation. It may interact with drugs and may be fetotoxic. Sweet almond oil- this is a diluted blend. How much? Rose– Topical max: 0.6% dilution. Eucalyptus– Avoid using with children under the age of 10 due to high 1,8-cineole which can cause respiratory distress. Do not ingest if you suffer from irritation of the GI tract or bile ducts or if you have any liver issues. Rosemary– Maybe neurotoxic depending on how much camphor is in the EO (check the GC/MS report!). Cineole ct: Avoid using with children under the age of 10 due to possible respiratory distress due to high levels of 1,8-cineole. Lemon (Citrus x limon L)- Dilute to 2% when using topically. Using more than the recommended dilution can cause adverse reactions such as phototoxicity. Jasmine (Jasminum officinale var. grandiflorum)- Dilute to 0.7% when using topically. Using more than the recommended dilution can cause adverse reactions such as sensitization. Palmarosa (Cymbopogon martini)- Dilute to no more than 6.5% when using topically. Using more than the recommended dilution can cause adverse reactions such as sensitization. Do not use internally, especially if you are taking drugs metabolized by CYP2B6. Rose (Rosa damascena) Flower oil- Dilute to 0.6% when using topically. Ingredients: Helichrysum, Ledum, and Celery seed. Rue– “Maybe abortifacient” and maybe “photocarcinogenic.” Do not use during pregnancy or lactation. Max dermal us is .15%. Ingredients: Water, Calcium carbonate, Cocos nucifera (Coconut) oil, Sodium bicarbonate, Glycerin*, Xylitol, Xanthum gum, Citrus paradise (Grapefruit) peel oil, Stevia rebaudiana leaf extract, Citrus reticulate (Tangerine) oil, Mentha spicata (Spearmint) leaf oil, Citrus limon (Lemon) peel oil, Lecithin*, Ocotea quixos (Ocotea) leaf oil, Eugenia caryophyllus (Clove) bud oil, Cinnamomum zeylanicum (Cinnamon) bark oil, Eucalyptus radiate leaf oil, Rosmarinus officinalis (Rosemary) leaf oil. Spearmint leaf extract Mentha spicata: Spearmint- max dermal use level of 1.7%. Using more than the recommended dilution can cause adverse reactions such as sensitization or mucous membrane irritation. Clove Flower oil (Eugenia caryophyllus)– Dilute to 0.5% when using topically, unless you have sensitive or damaged skin, then avoid using altogether. Using more than the recommended dilution can cause adverse reactions such as blood thinning, embryotoxicity, sensitization, or mucous membrane irritation. Due to methyleugenol content, may be potentially carcinogenic – always follow maximum dilution guideline. Do not use topically with children under age 2. Do not use internally, especially if you are on anticoagulant medications, about to have surgery, have a peptic ulcer or bleeding disorders, or take pethidine, MAOIs, or SSRIs. Cinnamon Bark (Cinnamomum zeylanicum)– Dilute to 0.07% when using topically. Using more than the recommended dilution can cause adverse reactions such as blood thinning, embryotoxicity, sensitization, or mucous membrane irritation. Avoid using if pregnant or breastfeeding. Do not use internally, especially if you are on anticoagulant and/or diabetes medications, about to have surgery, have a peptic ulcer, or bleeding disorders. Eucalyptus (Eucalyptus radiata)- Max Dilution: 20%, Using more than topical max can cause irritation or sensitization. Avoid using with children under age 10 due to potential respiratory distress. Rosemary Moroccan (Rosmarinus offininalis ct cineole)- Do not use with children under age 10, as it can cause slowed respiration due to high 1,8-cineole content. Rosemary Spanish ( Rosmarinus offininalis ct camphor)- Dilute to no more than 16.5% when using topically. Using more than the recommended dilution can cause adverse reactions, such as neurotoxicity. Avoid using if you have a seizure disorder. Eucalyptus blue- do not use on or around children under 10 due to 1,8-cineole content. 1,8-cineole has been known to cause breathing issues in young children. Eucalyptus bicostata is a bit unknown so it is hard to discern the exact safety issues of this oil. Ravintsara- Dilute to no more than 11% when using topically. Do not use with children under age 10, as it can cause slowed respiration due to high1,8-cineole content. Eucalyptus citriodora– This type of eucalyptus is different than others and is child safe. Eucalyptus radiate– do not use on or around children under 10 due to 1,8-cineole content. 1,8-cineole has been known to cause breathing issues in young children. Spearmint- max dermal use level of 1.7%. Anise– Potential carcinogen based on estragole content. Reproductive hormone modulator. May inhibit blood clotting. Avoid if pregnant, breastfeeding, have endometriosis or estrogen-dependent cancers. Don't use on children under 5 years of age. Do not use orally if on diabetes meds, diuretic meds, anticoagulant meds, if you have kidney issues, are having major surgery, peptic ulcer, or other bleeding issues. Rosemary- Maybe neurotoxic depending on how much camphor is in the EO (check the GC/MS report!). Cineole ct: Avoid using with children under the age of 10 due to possible respiratory distress due to high levels of 1,8-cineole. Clove- Moderate risk for skin sensitization. Moderate risk for mucous membrane irritation. May inhibit blood clotting. Drug interaction. Do not take orally if on pethidine, MAOIs or SSRIs, anticoagulant meds, or if you are going to have surgery, have a peptic ulcer, or other bleeding disorders. Do not use topically on sensitive skin, broken or damaged skin. Do not use topically on children under age 2. Orange Citrus aurantium –The Latin name points to Bitter Orange, not Sweet, which is phototoxic. Blue Tansy anacetum annuum– only an issue if you have problems metabolizing CYP2D6 drugs. Matricaria (Chamomilla recutita) – An issue if you have problems metabolizing CYP2D6 drugs. Cassia (Cinnamomum cassia)- High risk of sensitization. Mucous membrane irritant (low risk). May inhibit blood clotting. Drug interaction. Do not use if pregnant and/or breastfeeding. Do not use orally if on diabetes meds, on anticoagulant meds, if going to have surgery, have a peptic ulcer, or other bleeding disorders. MAX DILUTION: 0.01%* due to cinnamaldehyde content. Do not use topically on children under the age of 2. Ingredients: Vetiver, Lavender, Ylang Ylang, Frankincense, Clary Sage, Marjoram, coconut oil. 191 drops total EOs with only 35 drops coconut oil, which is a very unsafe dilution. Lavender- Not sure as to what type so there may or may not be safety concerns. French/Spanish Lavender (Lavandula stoechas) which contains fenchone and camphor and is not recommended during pregnancy and lactation. Spike lavender contains 1,8-cineole so may not be child safe. Frankincense- which kind? Boswellia payprifera is not recommended during pregnancy and lactation due to constituent octyl acetate. Ingredients: Copaifera officinalis† (Balsam copaiba) resin, Boswellia sacra† (Sacred frankincense) oil, Cedrus atlantica (Cedarwood)† bark oil, Caprylic/capric triglyceride, Tocopherol, Citrus aurantium bergamia† (Bergamot) peel oil (Furocoumarin-free), Mentha piperita† (Peppermint) leaf oil, USP-grade progesterone (from wild yam extract), Eugenia caryophyllus† (Clove) bud oil. Peppermint– Ingesting peppermint oil has been known to cause liver toxicity. Use with caution if you suffer from GERD, cholestasis, or have a G6PD deficiency. Using topically while lactating may cause supply to decrease. Avoid using with children under the age of 6 due to possible respiratory distress. Lemongrass– Lemongrass needs to be included at no more than a .7% dilution, as it is highly irritant/allergenic. Lavandin– May inhibit blood clotting. Myrtle– Myrtus communis – this species is “potentially carcinogenic” based on estragole and methyleugenol content. Lemon (Citrus limon)- assuming the Lemon in this blend is expressed, it is phototoxic if more than 12 drops per ounce are used. Wintergreen – inhibits blood clotting. Teratogenic in high doses. Avoid if on anticoagulant meds, having major surgery, hemophilia or other bleeding disorders. Do not use in any way/shape/form if pregnant or breastfeeding. Avoid using with children under the age of 10 due to possible respiratory distress. Do not use if you have salicylate sensitivity or have ADD/ADHD. Max dilution is 2.4%. Peppermint (Mentha piperita)- Using more than the recommended 5.4% dilution on the skin can cause adverse reactions such as redness, irritation, skin sensitization, or mucous membrane irritation. Use with caution if you suffer from GERD, cholestasis, or have a G6PD deficiency. Using topically while lactating may cause supply to decrease. Avoid using with children under the age of 6 due to possible respiratory distress. Eucalyptus radiata– All species do not use on or around children under 10 due to 1,8-cineole content. 1,8-cineole has been known to cause breathing issues in young children. Ingredients: Eucalyptus globulus, Pine, Marjoram, Eucalyptus radiata, Eucalyptus citriodora, Lavender, Cypress, Spruce, Peppermint. Eucalyptus Eucalyptus globulus – All species do not use on children under 10 due to 1,8-cineole content. 1,8-cineole has been known to cause breathing issues in young children. Myrtle Myrtus communis – this species is “potentially carcinogenic” based on estragole and methyleugenol content. Eucalyptus Eucalyptus radiata – All species do not use on or around children under 10 due to 1,8-cineole content. 1,8-cineole has been known to cause breathing issues in young children. Eucalyptus Eucalyptus citriodora – This type of eucalyptus is different than others and is child safe. Peppermint Mentha piperita – Using more than the recommended 5.4% dilution on the skin can cause adverse reactions such as redness, irritation, skin sensitization, or mucous membrane irritation. Use with caution if you suffer from GERD, cholestasis, or have a G6PD deficiency. Using topically while lactating may cause supply to decrease. Avoid using with children under the age of 6 due to possible respiratory distress. Olive oil – This is a diluted blend, but how much?? Lemon – assuming the Lemon in this blend is expressed; it is phototoxic if more than 12 drops per ounce are used. Ocotea –information on this is unknown. Proceed with caution. Matricaria– Also known as German Chamomile- only an issue if you have problems metabolizing CYP2D6 drugs. Rue Ruta graveolens – “Maybe abortifacient” and maybe “photocarcinogenic.” Do not use during pregnancy or lactation. Max dermal us is .15%. Ingredients: Clary sage (Salvia sclarea), peppermint (Mentha piperita), Spanish Sage (Salvia lavandulifolia), and fennel (Foeniculum vulgare). Peppermint (Mentha piperita) – Dilute to 5.4% when using topically. Using more than the recommended dilution can cause adverse reactions such as excess bile secretions, neurotoxicity, or mucous membrane irritation.Do not use with children under age 6, as it can cause slowed respiration due to high menthol content.Avoid if you have cardiac fibrillation or G6PD deficiency.Do not use internally if you have cholestasis or GERD. Sage Spanish (Salvia officinalis)– Dilute to 0.4% when using topically. Using more than the recommended dilution may cause neurotoxicity due to thujone content. Avoid using if pregnant or breastfeeding. Do not use internally. Avoid using if you have a seizure disorder. Ocotea Ocotea quixos –information on this is unknown. Proceed with caution. Ingredients: Water, Calcium carbonate, Cocos nucifera (Coconut) oil, Sodium bicarbonate, Glycerin (Vegetable), Xylitol, Xanthum gum, Mentha piperita† (Peppermint) oil, Mentha spicata† (Spearmint) leaf oil, Eugenia caryophyllus (Clove) bud oil, Ocotea quixos† (Ocotea) leaf oil, Cinnamomum verum† (Cinnamon) Bark oil, Citrus limon† (Lemon) peel oil, Eucalyptus Radiata† leaf oil, Rosmarinus officinalis† (Rosemary) leaf oil, Stevia rebaudiana leaf extract, Lecithin (Sunflower). Spearmint leaf extract Mentha spicata: Spearmint- max dermal use level of 1.7%.Using more than the recommended dilution can cause adverse reactions such as sensitization or mucous membrane irritation. Ocotea quixos (ocotea) leaf oil –information on this is unknown. Proceed with caution. Lemon (Citrus limon)– assuming the Lemon in this blend is expressed; it is phototoxic if more than 12 drops per ounce are used. Caprylic/capric triglyceride: Coconut oil, this is a diluted blend. How much? Geranium (Pelargonium graveolens) -Dilute to a maximum of 17.5% when using topically. Using more than the recommended dilution can cause adverse reactions such as sensitization. Do not use internally, especially if you are on diabetes medications, or taking drugs metabolized by CYP2B6.Blue tansy– only an issue if you have problems metabolizing CYP2D6 drugs. Rose- Topical max: 0.6% dilution.